Here’s a hint: They want stuff. Generation Y (or Millennials) refer to individuals born from 1980-early 2000s. Often referred to as coddled and self-centered, this generation is vastly different from those before them. According to research however, the pressure for employers to cater to these Millennials is mounting. Luckily, there are a variety of ways to incentivize these young people. If your strategy consists of simply paying them more money, however, you’re going to be in trouble. Money is rarely enough to keep younger talent engaged and on board. While Millennials obviously value money, they also place a great importance on the communal and social aspects of a company and their lives in general. Below are tips for keeping them productive, engaged and working for you. Coach and Develop. 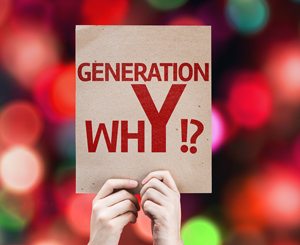 Generation Y employees regard their jobs as a continuation of their education. Thus, they need to feel as if they’re still learning, which means that your ability to listen, teach, and provide constructive feedback are essential to keeping your Gen Y staff feeling engaged and motivated. Clear Expectations. Talented employees often become frustrated when they feel as though they aren’t achieving anything. Accomplishments are seen as stepping-stones to success, which means it’s important for expectations and directions to be very clear to prevent burnout. Team Cohesiveness and Loyalty. These are two imperative tools for motivating and retaining Millennials. They often identify more strongly with their own team than they do with the company because the team provides professional and social support as well as a higher level of camaraderie. The Ability to Work Remotely. While many employers are concerned about productivity, this generation sees the option to work from home as a sign of trust. Contrary to popular belief, this will often result in the employee wanting to work harder and be more productive. Providing the ability to telecommute full-time is not necessary, but allowing your employees to work from home once or twice a week is a very attractive option to this generation. Office Environment. Upgrade your office with ergonomic, modern office furniture. Increasingly, studies have illustrated the significant health risks associated with sitting behind a desk for hours on end. Health and well being are very important to Generation Y employee, and the ability to work in a space that is both modern and comfortable will result in a happier employee who will want to be at work every day. Encourage Risk. Millennials enjoy challenges and risk (to some degree). This generation almost seems to crave change and challenge, so they will not shrink away from projects that force them to leave their comfort zone. Instead, they will view this opportunity as a vote of confidence in their abilities. Partner with Local Businesses. Generation Y employees place an extremely high value on work-life balance. Thus, when their company partners with local businesses such as gyms, daycares, and restaurants, employees will place a much greater value on this because a larger paycheck might not necessarily afford them the ability to participate in some of these activities. Career Planning. This is something employers should encourage, even if it results in the employee leaving to further their career. Millennials will insist on growth and mobility, and if they feel stifled, they won’t last. In addition to providing room for greater responsibility and growth, it is equally as important for them to feel as though you are a true partner in their career development and truly care about their personal growth. Social Recognition. Manager praise and recognition is imperative, as is the case with almost any generation. For Millennials, the ability for their peers to echo that praise is also important. Customized Rewards. Generation Y has grown up in a system that consistently provided specific goals and rewards upon completion of those goals. In order to incentivize and motivate, companies that create specific reward systems for employees will be highly effective at retaining their Millennials. Millennials have proven to work the hardest when there is a specific cause or end result that provides the ability to see how they have made a difference. So if your company is already doing this, you’re off to a good start. However, this alone won’t be enough. In the end, it is no longer simply about a larger paycheck. Millennials have high expectations for their everyday lives, which means that certain perks including the ability to work from home; the ability to belong to a gym or daycare at a reduced cost; and other customized rewards are almost mandatory. Bottom Line: Who says they’re spoiled? They do. Make it work for everyone.